There used to be a really cool model for producing great work, three sides of a triangle that dictated how things would happen. It was reasonable that you could ask your clients (or yourself) to pick two. Only two of the sides could be achieved at once. If someone wanted Quality and Speed, it would Cost MORE. If someone wanted Quality and low Cost, it would take LONGER. If someone wanted Speed and low Cost, the Quality would SUFFER. 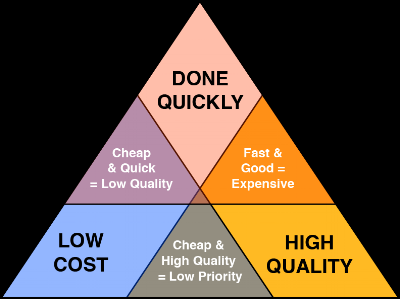 People lived by the Quality Triangle for a long time. But that time has passed. I love Amazon, but it's model is to provide ALL three sides of the triangle. It has embraced that on a significant scale. And this approach to business (the expectation of customers) has permeated every industry, from creative to manufacturing (though we may all be loathe to admit it). If you're a creative especially, this can be a hard thing to accept. We need our time. We always need MORE time. What's the solution? We can rebel against the collapsing of the triangle. But we do this at our own peril. Going slow has come to imply that someone is passing you. Being expensive implies someone can do it for less. And though the qualities others provide may only be 90% as good as what you provide, there are some people who can't appreciate that last 10% anyway. I'm not advocating for less quality or less time or that we cheapen ourselves. I am advocating that we be aware of the market, and figure out how we are going to respond accordingly. Providing deeper value is part of the solution. Audience/customer experience is key. So maybe we start there.